Critical WordPress REST API Bug: Prevent Your Blog From Being Hacked! Last week, WordPress patched three security flaws, but just yesterday the company disclosed about a nasty then-secret zero-day vulnerability that let remote unauthorized hackers modify the content of any post or page within a WordPress site. The nasty bug resides in Wordpress REST API that would lead to the creation of two new vulnerabilities: Remote privilege escalation and Content injection bugs. Wordpress is the world's most popular content management system (CMS) used on millions of websites. The CMS recently added and enabled REST API by default on WordPress 4.7.0. The vulnerability is easy to exploit and affects versions 4.7 and 4.7.1 of the Wordpress content management system (CMS), allowing an unauthenticated attacker to modify all pages on unpatched sites and redirect visitors to malicious exploits and a large number of attacks. The vulnerability was discovered and reported by Marc-Alexandre Montpas from Sucuri to the WordPress security team who handled the matter very well by releasing a patch, but not disclosing details about the flaw in an effort to keep hackers away from exploiting the bug before millions of websites implement the patch. "This privilege escalation vulnerability affects the WordPress REST API," Montpas writes in a blog post. "One of these REST endpoints allows access (via the API) to view, edit, delete and create posts. Within this particular endpoint, a subtle bug allows visitors to edit any post on the site." The issue was discovered on January 22nd, patched on January 26th and the fix was made available in release 4.7.2 to websites using the popular CMS. Sucuri security providers and hosts worked closely with Wordpress security team for over a week to install the patch, ensuring that the issue was dealt with in short order before it became public. The company also tipped off security companies including SiteLock, Cloudflare, and Incapsula over 9 days between disclosure and patch. "We believe transparency is in the public's best interest...[and]... in this case, we intentionally delayed disclosing the issue by one week to ensure the safety of millions of additional WordPress sites." The flaw has been rated critical, although the fix has automatically been deployed on millions of WordPress installations in the few hours after the patch was issued. For a more technical explanation about the vulnerability, you can head on the Sucuri's official blog post. 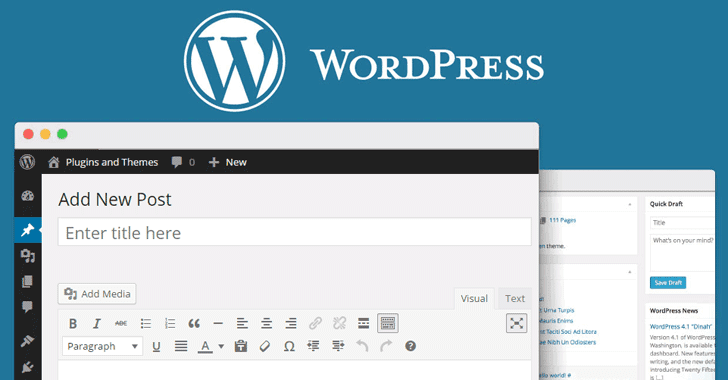 WordPress admins who have not yet implemented the patch against the nasty vulnerability are strongly advised to update their CMS to Wordpress version 4.7.2.